County of Carmarthen: Bettws, Kidwelly, Kidwelly St. Mary (2), Llanedy, Llanelly (4), Llangennech, Llanon (2), Pembrey (3). County of Glamorgan: Lougher, Lougher (Borough). The population falling within the union at the 1831 census had been 17,000 with parishes ranging in size from Kidwelly (population 246) to Llanelly itself (7,646). The average annual poor-rate expenditure for the period 1834-36 had been £4,404 or 5s.2d. per head. 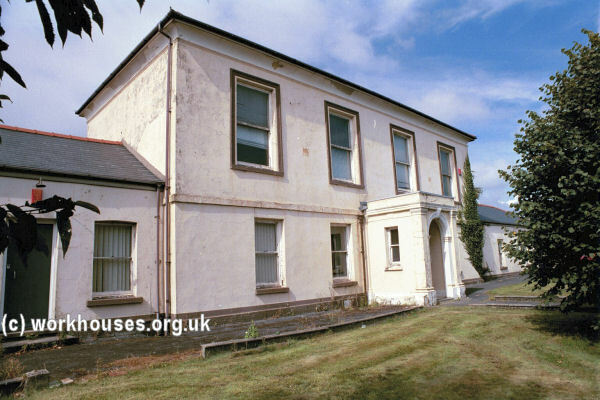 The Llanelly Union workhouse was erected in 1837-8 at the north side of the Swansea Road. The Poor Law Commissioners authorised an expenditure of £2,800 on construction of the building which was to accommodate 200 inmates. Its location and layout are shown on the 1921 map below. The layout of the workhouse followed the popular square plan with a two-storey entrance and administrative block at the south, connecting to a central supervisory hub. Accommodation ranges for the different classes of inmate (male/female, infirm/able-bodied) radiated to the north, east and west with the areas in between forming segregated exercise yards. A separate block to the north would have contained the workhouse infirmary or idiot wards. Llanelly entrance block from the south-west, 2000. Llanelly central hub and rear of front block from the west, 2000. Llanelly eastern range block from the south-east, 2000. Troops were billeted at the workhouse during the Rebecca Riots of 1842-3 and one of the ringleaders, David Davies, was held there for interrogation before being removed the County Goal at Carmarthen and later transported to Australia. After 1930, the former workhouse was redesignated as a Public Assistance Institution. After 1948, the site became Bryntirion Hospital and continued to provide geriatric care until its closure in September 2004. 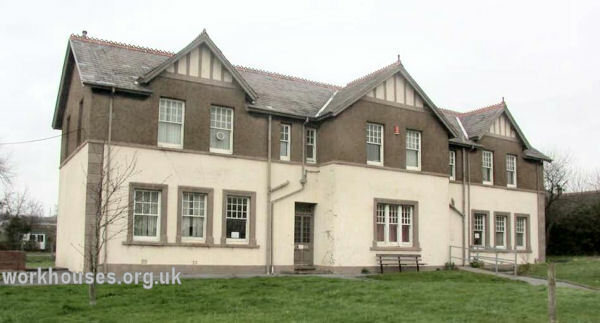 The site is being redeveloped but, after a successful campaign by the local Llanelli Community Heritage group, the entrance and hub sections of the old building are to be preserved. 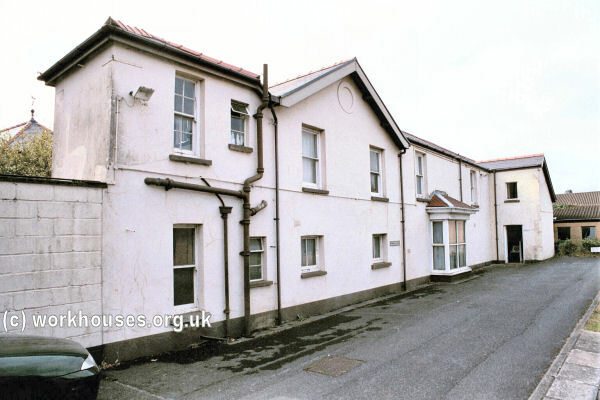 A separate T-shaped building immediately to the west of the workhouse served as the union's children's home from around 1900. It later became the town's register office. 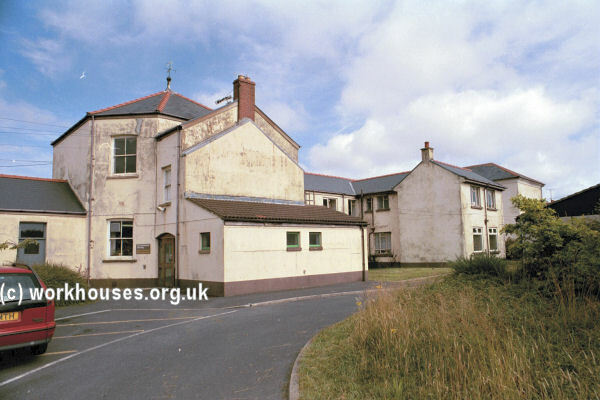 Llanelly union children's home from the south-west, 2004. Courtesy of Llanelli Community Heritage. A campaign in 2004 to save this building unfortunately proved less successful and its demolition was due to take place in early 2005. Carmarthenshire Archives Service, Parc Myrddin, Richmond Terrace, Carmarthen, SA31 1HQ. The only surviving local records appear to be Guardians' minute books (1836-1930).